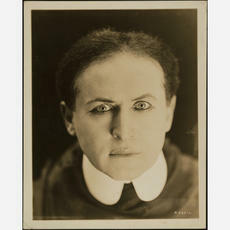 This is the first in a series of two posts about Houdini at the Smithsonian. Read Part II here. After Harry Houdini died in November of 1926, laid low by a ruptured appendix, the world’s most famous magician performed one final escape—from neither handcuffs, nor his famed “Chinese Water Torture Cell,” but a trap far more permanent: the anatomical collection of the Smithsonian Institution. The spring before, during what became Houdini’s last visit to Washington, DC, the fifty-two-year-old escape artist had paid a visit to the laboratory of Dr. Aleš Hrdlička, the Smithsonian’s Bohemian-born curator of Physical Anthropology. 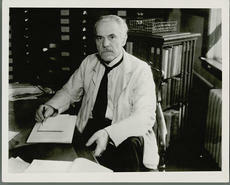 Hrdlička had institutionalized Physical Anthropology at the Smithsonian with his arrival in 1904, and under his tenure the National Museum’s collection of human remains—of Americans of indigenous, European, African, and Asian descent—had multiplied several times over. Although the darker extensions of physical anthropology in Europe and the Americas are clear—for example, the correlation of supposedly stable physical traits with inheritable psychological characteristics as “race” and, most notoriously, their application by Nazi doctors—Hrdlička also studied the history of migration in the Americas and documented variation in bodies over time. It was to that end that he had invited Houdini to his third-floor chambers in the National Museum. Hrdlička had examined another escape artist and, “[having] found this man more or less abnormal physically … he expected to find these abnormalities even more marked in the case of Houdini,” Washington’s Evening Star reported on November 2, 1926. Yet in submitting to the measurements, Houdini confounded the physical anthropologist thrice over. First, Hrdlička peppered the magician with questions regarding his ancestry. His notes on the meeting—stored in box 32 of Hrdlička’s papers at the National Anthropological Archives of the Smithsonian—suggest that Houdini made no admission that he was born anywhere but Appleton, Wisconsin. 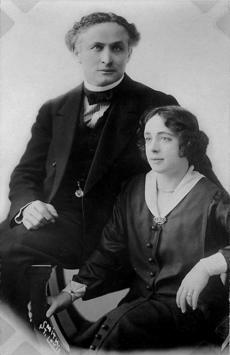 He certainly did not divulge that he was born in Hungary as Eric Weisz, the son of a Rabbi who emigrated to the United States in 1878, when Houdini was four. The story of human remains at the Smithsonian is tragically complex, not lacking in controversy—but, for America’s consummate escape artist, it ended at his visit with Hrdlička. “To this proposal Houdini laughingly declined to agree,” the Daily News claimed. “Still smiling, he took his wife’s hand in the taxi and said, ‘If I die first, what’s left of me belongs to you.” Hrdlička was left with his sheet full of measurements, nothing more. Just over a half-year later, the magician’s posthumous wishes came true. After he died in a Detroit hospital on October 31, he was placed in his bronze “Buried Alive” casket and sent to New York, where he—and his brain—were embalmed and buried alongside his mother in the Jewish Machpelah Cemetery. Although Bess, his wife, was buried separately in a Catholic cemetery when she died seventeen years later, she had long since benefitted from her inheritance of the secrets of his greatest tricks, a sixth of his estate, and a $50,000 payout in life insurance—won after proving that a student sucker-punched the magician in his Montreal dressing room, likely speeding his appendix to rupture. 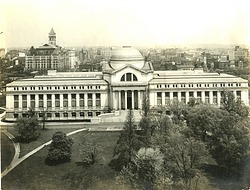 In exchange, she had executed one of the more specific details of his will: that she deliver his massive library on magic, Spiritualism, and demonology—valued at $30,000, it would be worth at least $370,000 today—to the Washington institution Houdini had deemed best: the Library of Congress.